It has been a while and I am glad that it would be with the Selangor Times, the kind of publication that serves the community. A page twice monthly (alternating with technology) gives me a chance to share my knowledge of the game from a player and trainer perspective i.e. less words and more diagrams, moves and games. We should not forget that when in print it is not just chessplayers who will see (and read?) and so I will endeavor to do my best that the news being published shows our very best face (as much as we will allow it to!) 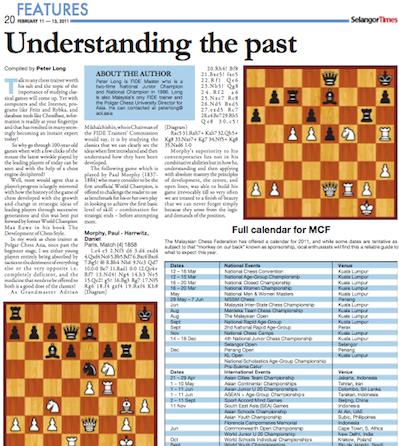 and my editor has also kindly agreed that it will also be a place where organisers in the Klang Valley actually interested in promoting chess will be able to advertise their events without charge. You know how it works - just drop me an email with plenty of time to spare (I too have a day job) with all relevant information.